Now that we’ve finished our collective freak-out over the new Star Wars: Episode VII – The Force Awakens trailer, we’ve decided to take a look back on the films that made the franchise the major success that it is. Hopefully, by the time the J.J. Abrams-directed flick hits theaters, all of us will be Star Wars experts. 1. So sure that Star Wars: Episode IV: A New Hope would fail, George Lucas actually skipped the premiere to vacation in Hawaii with his pal Steven Spielberg, where they came up with the idea for Raiders of the Lost Ark. 2. In Star Wars: Episode V – The Empire Strikes Back, Mark Hamill had to hit his head on the ceiling of Yoda’s hut 16 times before director Irvin Kershner was satisfied. 3. The scenes featuring Luke Skywalker’s Jedi powers retrieving his lightsaber from far away were achieved by having Mark Hamill throw the lightsaber then running the film in reverse. 4. Han Solo’s famous response to Princess Leia’s “I love you” (“I know”) was actually unscripted. It was originally was supposed to be “I love you too,” but Harrison Ford suggested something a little more fitting for the character, and thus the line was born. 5. Darth Vader has only 12 minutes of screen time in the first film. 6. Initially R2-D2 could speak standard English and even had quite the foul mouth. Though his English speech has been removed from the films, C-3PO’s reactions to it remain. 7. While filming Star Wars: Episode I – The Phantom Menace, Ewan McGregor made lightsaber noises while he dueled; they had to be corrected in post production. 8. Darth Vader’s body, David Prowse, has never met his voice, James Earl Jones. 9. In Attack of the Clones, we see that Jar Jar Binks is indirectly responsible for the fall of the Old Republic and the near-annihilation of the Jedi order. The most hated character in the Star Wars universe, standing in for Senator Amidala, puts forth the motion that gives Palpatine supreme powers. 10. Tupac Shakur expressed interest in reading for the part of Mace Windu and even lobbied his mutual friends of George Lucas for a meeting, but ultimately died before getting the chance. 11. In Return of the Jedi, as Darth Vader throws the Emperor down the Death Star shaft, it’s the only time the Jedi theme music is played over a shot of Vader. It represents his return to the light side of the force. 12. Darth Maul only blinks once throughout all of The Phantom Menace; the one time he blinks is when Obi-Wan slices him. The contact lenses that Ray Park had to wear for the character made it difficult to blink; he also liked the idea of a villain who never stops staring. 13. 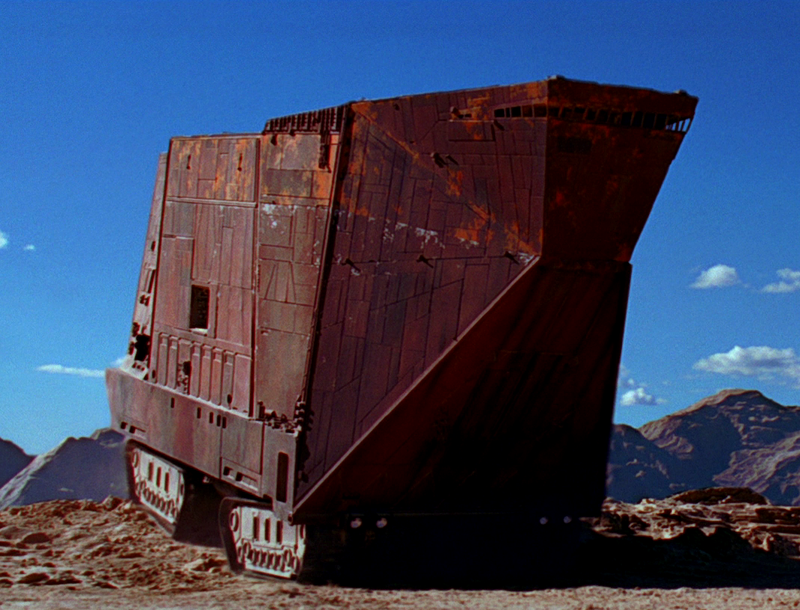 While filming A New Hope on location in Tunisia, the Libyan government became concerned when they saw a massive military vehicle parked near the border; it was just a Jawa sandcrawler. 14. The scene where Darth Vader’s TIE Fighter spirals out of control was added late in the film because Lucas insisted; originally, it was opposed because it implied there would be a sequel, which, at the time, was considered an inferior, sell-out move. 15. The sets for The Phantom Menace were constructed only to the heights of the actors and the rest was digitally enhanced. However, Liam Neeson is so tall that he cost production an extra $150,000 in consctruction. 16. After their epic duel, Obi-Wan picks up Anakin’s lightsaber, which he gives to Anakin’s son, Luke, in Star Wars: Episode IV – A New Hope. 17. Natalie Portman and Keira Knightley looked so alike when in hair and make-up that even Knightley’s mother had trouble identifying her daughter when visiting the set. 18. When the cast and crew decided to fly coach to London to save money, Carrie Fisher’s mother, Debbie Reynolds, caused a fuss over the phone with George Lucas. Fisher simply grabbed the phone and said, “Mother, I want to fly coach, will you f**k off? !” and hung up. 19. Before Star Wars: Episode IV – A New Hope, George Lucas’ decision to accept a lower salary in exchange for merchandising rights was considered a foolish gamble. Star Wars changed that perceptions and the way movies were merchandised forever.